This entire week was dominated by a massive 4 day storm. We occasionally see this type of weather event in spring and fall, but it is extremely rare for the middle of the summer. We had groups this week that arrived, fished, and departed with their rain gear on. It was not just the rain, but the wind and the cold. We had sustained high winds from the North for days along with temps that hovered in and around the mid 40s to low 50s. 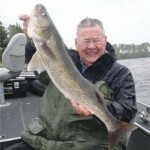 It was uncomfortable fishing and when the weather broke, it was extremely difficult fishing. To give you an idea of how strong this system was, main lake surface temps had been in the high 60s to mid 70s, but by Thursday, the warmest water you could find in the south basin was 57 degrees. I explained to my groups that this system put the fish into a blender and pushed Puree. 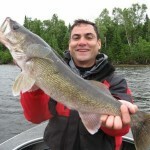 By midweek, we instantly had walleyes on deep summer water structure and caught some of our best fish out of water 30ft. and deeper. 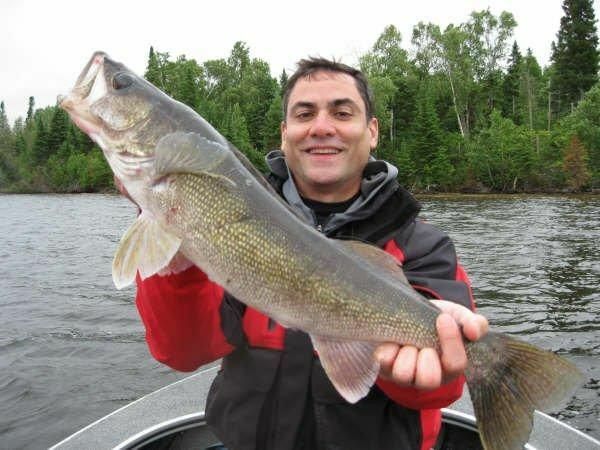 The bass bite got put on hold until Thursday and the pike bite cratered. It was an extremely challenging guiding week. If you were not firmly committed to checking multiple depths and patterns many times a day, you would crash and burn. 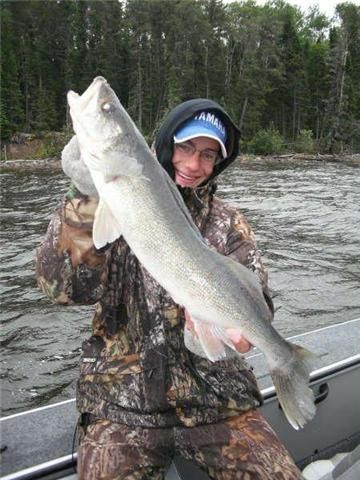 Despite the rough conditions, we still managed to share information and salvage a pretty good week for walleyes. For the week we had 23 over 27 in., including 2 – 28s and 3 – 29s. 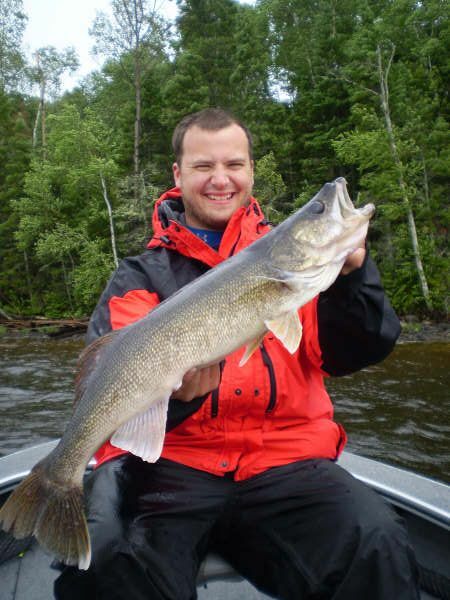 Daily guide sheets averaged 35 walleyes over 18 in. per boat per day. The highest daily total for the week was 65. 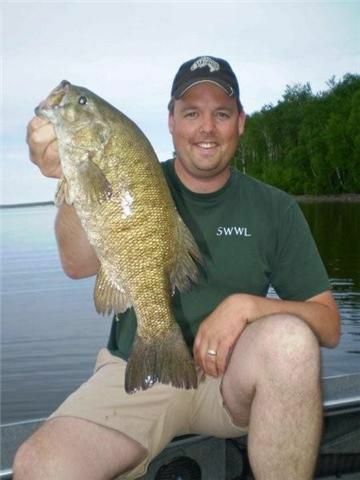 When the walleyes moved to summer patterns deep, 3/8 oz. jigs and minnows worked the best. When the storm broke, we had to gear down to ¼ and occasionally 1/8 oz. 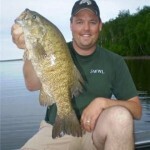 jigs even in deeper water to get fish to bite. 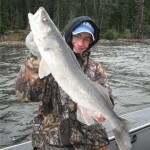 Thursday and Friday were beautiful weather days, but were very tough for walleyes. 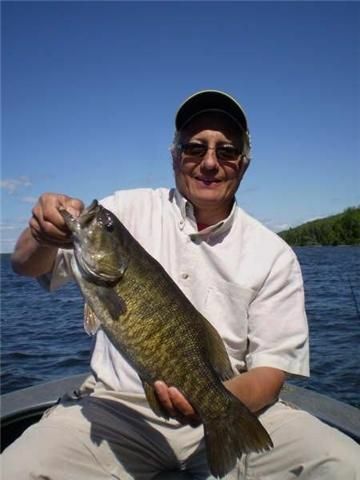 The brilliant sunshine brought some fish back from the depths into normal transition spots, but the bite was lack luster at best. 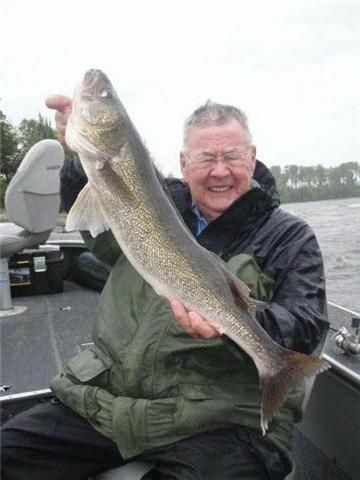 There are still groups of walleyes scattered from 4 – 34 ft. and all across the lake and until the weather stabilizes, this will be the norm. For the past 2 days, it has been a run and gun, 10 to 20 to 30 and back relay race. Pick up a couple of fish at each spot and consider yourself lucky and move on. The bass bite picked up again after the weather broke. Almost all were caught on Thurs. and Fri. We had 66 over 17 in. for the week including 16 – 18s, 1 – 19 and 1- 20. Versatility was the still the key. 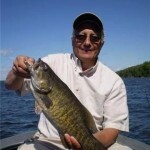 Spinnerbaits were the best option in some areas and in others, big tubes rolled over rocks were the trick for big bass.